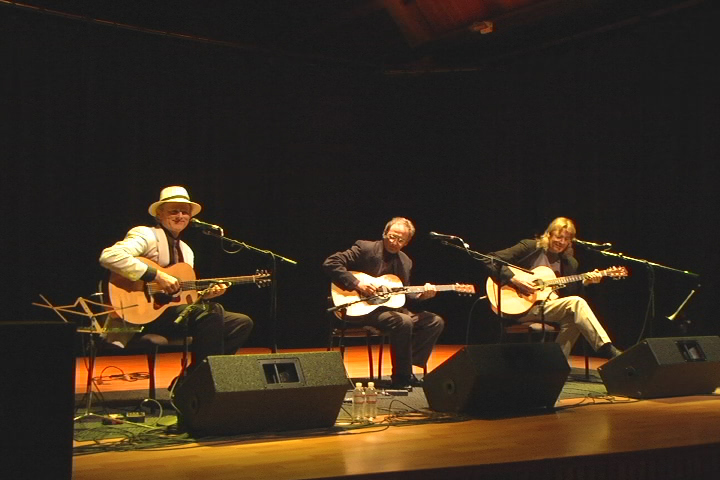 Portland, Oregon’s virtuoso acoustic guitar trio – Acoustic Guitar Summit – is made up of three of the country’s best fingerstyle guitarists. 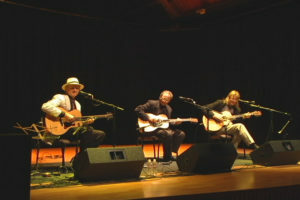 Two members, Doug Smith and Mark Hanson, won a Grammy Award in 2005 for their contributions to the Henry Mancini – Pink Guitar CD. The third member, Oregon Music Hall of Fame member Terry Robb, is the perennial winner of the Cascade Blues Association’s “Top Acoustic Blues Guitarist” award. The three of them will also be doing a guitar workshop from 4-6pm on this same day at Boulevard Music. Their music is heard on national television (Martha Stewart Living, American Idol), major films (August Rush, Twister, Moll Flanders) and National Public Radio (Echoes and West Coast Live). In addtion, their recordings are regularly licensed for syndicated TV and radio broadcasts, and regional and national advertising campaigns. currently records for the Memphis blues label Yellow Dog Records. Mark Hanson is internationally known for his numerous recordings, and for his 30+ guitar instruction manuals and videos. Four of his titles were named to the Top 100 acoustic music publications by Acoustic Guitar magazine, and one was recenty included in the book 50 Greatest Guitar Books. His music is heard on national TV and radio programs, including American Idol. National fingerpicking champion of 2006, Doug Smith regularly records with Mannheim Steamroller and Lion King and August Rush film composer Mark Mancina. A world-traveling talent, Doug’s stunning solo fingerstyle compositions and arrangements, including John Phillip Sousa’s “Stars and Stripes Forever”, have thrilled audiences from New York to Bejing. AGS members have been featured on Oregon Public Broadcasting’s Oregon Art Beat program, and have shared the stage with such luminaries as Jerry Garcia, John Renbourn and Tommy Emmanuel. Doug and Mark recently arranged and recorded duets for Bert Bacharach and Leiber & Stoller tribute CDs, follow-ups to the 2005 Grammy-winning Mancini CD, which won in the Best Pop Instrumental Album category. Their two CDs – Summit Meeting and holiday recording O Christmas Three – are available through Accent On Music and on iTunes.